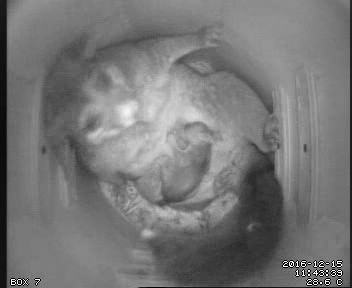 Today, Sasha slept in Box 7 for the first time in over a month, and her latest baby briefly came out of the pouch. This is the first time the baby has been seen out of the pouch. Sasha often seems to prefer Box 7 when she has babies (hopefully because it's a safer place for them to play), so with luck we'll see a lot more of the little one in coming weeks. Currently the baby is barely furred and only occasionally emerging from the pouch for short periods - nowhere near the "being a real pest and jumping all over mother while she's trying to sleep" stage - but they grow up quickly, so stay tuned. I just got back from New York & couldn't wait to check in on your possums etc, so much excitement this festive season around your home. I had WIRES turn up at my home to look after my wildlife while away. When I stayed in bear run forest in Pennsylvania I got to see my very first chipmunk, lots of squirrels too, but the chipmunk was so so cute, cheeks stuffed with nuts disappeared off into its burrow to store them before the snow set in. Lovely to see Sasha with her new baby. Would like to wish you and your family and all your possums a very merry Christmas and a happy new year.